The internet, and all the social media apps tethered to it, are amazing examples of our freedom of speech. You can pretty much post what you want, when you want, and that's amazing. But on Instagram, that can lead to a lot of digital detritus filled with blurry landscapes, questionable selfies, and endless pictures of food. 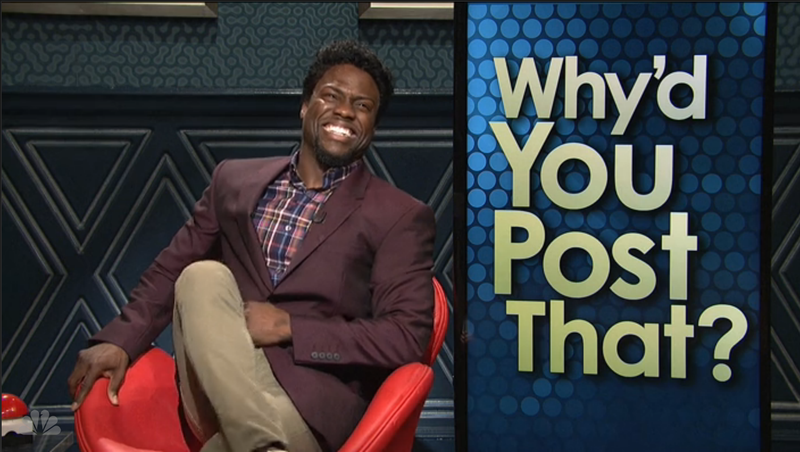 Kevin Hart and SNL share our frustration and aim to shame with its Instagram policing talk show, "Why'd You Post That?" The premise is simple. Bring terrible Instagramers onto the show, drill them on their tasteless photos, and inevitably throw them into a wall dungeon for a week. I have a feeling this show would run out of contestants fast, but then again there are always a wealth of people willing to duke it out on Jerry Springer, so who knows.